Louis Jacobson, who writes a regular political column for Governing Magazine (he’s also an author of the Almanac of American Politics), reviewed the 36 gubernatorial races this year, and as of today, rates Colorado a toss-up with Alaska, Connecticut, Florida, Michigan, Minnesota and Nevada. If there is a Democratic tide, they could pick up 5 to 7 seats. Democrats are only defending 9 seats to 26 for the Republicans. Due to the caucus results, polling and expert observations, Jacobson believes Cary Kennedy is the Democratic frontrunner, with Jared Polis still able to change the outcome with money. 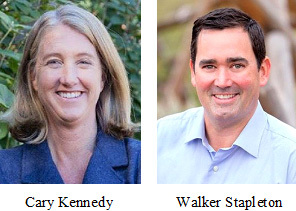 Walker Stapleton is seen as the Republican frontrunner, with Vic Mitchell with money and Steve Barlock with some Trump support still in it. It is still early for both primaries. Most analysts see the state as having a slight Democratic tilt.